Sri Sathya Sai Baba, also known as Sathya Sai Baba, Sai Baba, or simply Baba to millions of people in this world is an AVATAR. An Avatar is the incarnation of God in human form. God - as can be conceived by a sentient being such as man - is, firstly, in principle, omnipotent, omnipresent and omniscient and the ideal of goodness, and secondly, in living experience, One who manifests all human values in their purity and perfection; who shows in human life, power, wisdom and knowing beyond the comprehension of man. Sathya Sai Baba is known to many to be the latter and accepted by many to be the former. "Whenever Ashanthi or disharmony overwhelms the world, the Lord will incarnate in human form to establish the modes of earning Prasanthi or supreme peace and to re-educate the human community in the paths of peace" says Sathya Sai Baba. Sathya Sai Baba is the Divine Teacher of Teachers among Divine Teachers such as Buddha, Zorathustra, Jesus Christ, Guru Nanak, Adi Shankara and others. In terms of Avatarhood (God in human form), Sathya Sai Baba is a Poorna (full) Avatar in whom immense powers lie at His Will. Sathya Sai Baba was born on 23 November 1926 in a remote village called Puttaparthi, in the State of Andhra Pradesh in India. He is the fourth child of a humble and pious couple and was named Sathya Narayana Raju. Even as a child, He displayed superhuman powers. In May 1940, at the age of 14, He disclosed that He is the reincarnation of Shirdi Sai Baba. This Sai Baba of Shirdi, though a Hindu brahmin by birth, lived the life of a Muslim fakir in the village of Shirdi, in the State of Maharastra in Western India. Shirdi Sai Baba laid the foundation for Hindu - Muslim unity in Northern India by the example of His life and activities. Before His death in 1918, He prophesied that He would reincarnate 8 years later. In October 1940, Sathya Narayana Raju announced that He is "Sathya Sai Baba" and that He was leaving His parents as His devotees were waiting for Him. Sathya Sai Baba left His home and began His teaching. In 1945, His devotees began the construction of the Mandir (temple) and residential buildings for an Ashram (a retreat) about a mile away from His village. He named this Ashram "Prasanthi Nilayam" (Abode of Supreme Peace). Today thousands of Sai devotees (spiritual aspirants) converge at this divine centre, Prasanthi Nilayam. 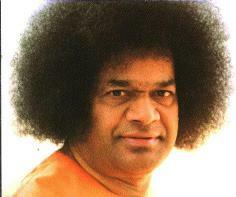 Sathya Sai Baba has descended as an Avatar for all mankind and not for any particular community, religion or interest. His teachings are universal and not sectarian. Devotees, seekers and adherents of all faiths from all nationalities and countries find their way to Prasanthi Nilayam driven by the quiet conviction that they will encounter the Avatar and receive His Darshan (divine sight with blessings). The teachings of Sathya Sai Baba are for all people, for all lands and for all times. He is on an universal mission. He has declared, "I carry no labels assigning a country of origin or residence for Myself. The entire mankind is My family. There is no one in this world who does not belong to Me. All are Mine. They may not call out My Name but still they are Mine. I shall not give you up even if you keep afar. I shall not forsake even those who deny Me. I have come for all. Those who stay and stray away will also be drawn near and saved". "My mission is to grant you courage and joy, to drive away weakness and fear. Do not condemn yourselves as sinners. Sin is a misnomer for what are really errors, provided you repent sincerely and resolve not to follow the evil again", says Sathya Sai Baba. Sathya Sai Baba says He is beyond any description except, perhaps, as an embodiment of pure selfless love. He emphasised the supreme importance of pure love when He said, "I have come to light the lamp of love in your hearts, to see that it shines day by day with added lustre. I have come to tell you of this universal unitary faith, the inner Self Principle, this path of love, this righteousness of love, this duty of love, this obligation of love". He continues, "Believe that all hearts are motivated by the One and only God; that all names in all languages and all forms that man can conceive, denote the One and only God. His adoration is best done by means of LOVE. Cultivate that attitude of oneness between men of all creeds, all countries and all continents. This is the message of Love I bring. Foster Love; live in Love; spread Love - that is the spiritual exercise which will yield the maximum benefit". Sathya Sai Baba works tirelessly. His works are conducted within and without. The works without may be seen in the number of High Schools and Colleges in India. The more prominent among these is the Sathya Sai Institute of Higher Learning at Prasanthi Nilayam where children complete their education from primary to tertiary levels. Admissions to Sathya Sai Institutions of Learning are eagerly sought and cherished by all parents as the education is based on human values of Sai principles for material and spiritual growth and development. Sathya Sai Baba says, "Education without character, science without humanity, commerce without morality is useless and dangerous". He is concerned for the sick and Sai hospitals have been built. Intricate heart operations are done at the Super-Speciality hospital at Prasanthi Nilayam which is equipped with ultra-modern facilities. His task of spiritualising humanity is undertaken through Sathya Sai Centres in various parts of the world. The spiritual program is classified into three groups of activities - Spiritual, Education and Service. Spiritual activities consist of participation in Bhajans (devotional singing of songs in praise of God in all faiths) and the celebration of holy festivals of all faiths. The education activities include Education in Human Values programs where children are given ethical, moral and spiritual values founded on the principles of TRUTH, RIGHTEOUSNESS, PEACE, LOVE and NON-VIOLENCE; the Study Circles for adults in which the teachings of Sri Sathya Sai Baba are discussed and studied. Under service, organised service activities - such as serving the sick, aged and the handicapped - are carried out including serving those in need in the public and private institutions and individuals/families in their homes. The work Sathya Sai Baba does within is the distinction of the Avatar who transcends the physical and the mental planes and is immersed in the universal consciousness which pervades mankind and the universe, where the Divine Will is dominant. His mission is to lead mankind safely to the era of peace and plenty where human societies will live in co-operation and goodwill with human relationship founded upon Truth and Love. He has said that He would not fail in this mission. After eventually leaving this present body, He says that He will return - again through the process of ordinary human birth - and continue His work under the Name of "Prema Sai Baba". This will be the third and final incarnation of Sai Baba. "If I have come amongst you as Narayana with four arms, holding the Conch, the Wheel, the Mace and the Lotus, you would have kept Me in a museum and charged a fee for those seeking My Darshan. If I had come as a mere man, you would not have respected My teachings and followed them for your own good. So I have to be in this human form with Superhuman wisdom and power - and I show you, now and then, these miracles.. I have engaged in no Tapas (ascetic practices). I have no Dhyanam (meditation) at all. I do not study. I am no Yogi or Siddha or Sadhaka (spiritual aspirant). I have come to guide and bless all Sadhakas. I am neither man nor woman, old or young; I am all these. I am the inner spring in all that moves and exists. I am the energy, the power that propels and impels. I am the Knower, the Knowing and the Knowledge. Be whatever you like, do whatever you choose, remember this well, that all you do is known to me. I am the inner Ruler of all. I am seated in your hearts". While Sathya Sai Baba is concerned with the soul of man, He recognizes that man is a social person as well and has obligations to society. He requires all His devotees to comply with the Code of Conduct for their spiritual development and observe the Ten Principles to ensure a fruitful and harmonious life in society. 1. Do daily meditation and prayer. 2. Do devotional singing/prayer with family members once a week. 3. Participate in Sathya Sai Spiritual and Educational programs (Bal Vikas) organized by the Sai Center for children of Sai devotees. 4. Participate in community work and other programs of the Sai Organization. 5. Attend, at least once a month, Group Devotional Singing (Bhajans) organized by the Sai Center. 6. Study Sai literature regularly. 7. Speak softly and lovingly to everyone. 8. Do not talk ill of others especially in their absence. 9. Put into practice "Ceiling on Desires" and utilize savings thus generated for service to Mankind. 1. Treat as sacred the land in which you were born. Have patriotism to your nation - but do not criticize other nations or put others down. Not even in your thoughts or dreams should you think of bringing grief to your country. 2. Respect all religions equally. 3. Recognize the Brotherhood of Man and treat all as brothers. Love all. 4. Keep your house and surroundings clean for this will promote hygiene and health and help you. 5. Practice charity, but do not encourage beggars by giving money. Provide them with food, clothing and shelter. Help them in other ways but do not encourage laziness. 6. Never give a bribe or take a bribe. Do not yield to corruption. 7. Curb envy and jealousy; expand your vision and outlook; treat all equally regardless of caste and creed. 8. Do as much as possible by yourself though wealthy and having servants. Do service to society in person. 9. Have and cultivate Love for God and fear of sin. Abhor sin. 10. Never go against the laws of the land. Follow these diligently both in word and in spirit. The Public Relations Office, Prasanthi Nilayam, Annatapur District, A.P., 515 134, India. Telephone: 91-8555-87375 and 91-8555-87236, Fax: 91-8555-87390. Devotees or visitors (from outside India) to Prasanthi Nilayam are required to register at the Registration Office on arrival. Accommodation is then allotted at the Accommodation Office. A small fee is charged. The dress preferred is white shirt and trousers for men and ankle length dress/skirt or sarees for ladies. Shorts are not permitted. Seating arrangements for all activities in the ashram separate the men form the ladies. The spiritual program in the ashram begins with the OMKAR (chanting of the OM 21 times) and SUPRABHATAM (awakening the Lord prayer) at 5.00 to 5.30 a.m. followed by NAGAR-SANKIRTAN (Bhajans around the Sai Mandir) at 6.00 a.m. Sathya Sai Baba grants Darshan twice a day (morning and evening) each followed by half an hour Bhajans. He grants private audience to whosoever He calls during Darshan. The program for the day ends with a short meditation in the Mandir (temple) at 7.00 p.m. Residents in the ashram are urged to retire by 9.00 p.m.